Married couple, Pete and Ellie Wagner (Mark Wahlberg and Rose Byrne), are doing well, making money renovating and “flipping” houses. One day, they begin to wonder if something is missing in their life, because unlike their respective siblings, they don’t have children. Natural child-birth is problematical for the Wagners, so they look into adoption. They meet Karen (Octavia Spencer) and Sharon (Tig Notaro), a pair of social workers who introduce them to the way the system works. They attend group meetings of prospective adoptive parents and they are introduced to potential adoptee kids. None of this is easy. Pete and Ellie find themselves on an emotional rollercoaster just having to deal with the process itself, way before any decisions have been finalised. Before they adopt, they first need to foster a child. Some children have been in the system for years because the life of their birth parents is unstable. They are moved from foster home to foster home. The more the Wagners investigate the world of fostering and adoption, the more neediness and deprivation they see. The Wagners discover there are some older children who don’t expect to be adopted at all. Lizzie (Isabel Moner) is one such teen. Her mother is in jail on drug charges. They express interest in fostering Lizzie. She turns out to have two younger siblings, Juan (Gustavo Quiroz) and Lita (Julianna Gamiz). By taking on all three kids, Ellie and Pete have their life thoroughly disrupted and transformed. The kids present a number of behavioural challenges that their new foster parents are in no way prepared to deal with. The parental support group is some help, their own extended families are somehow less help. 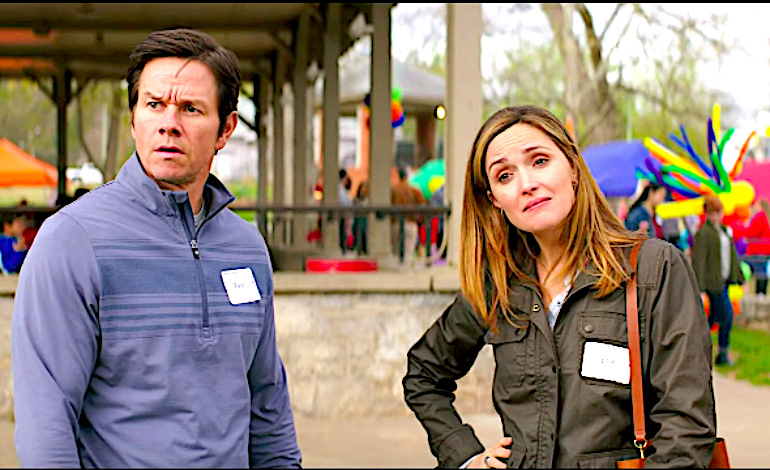 INSTANT FAMILY is presented as a comedy in its trailers and this does the film a slight disservice. If you go to this expecting laughs in the mould of DADDY’S HOME 1 or 2, which were co-written and directed by Sean Anders, as this movie is, then this isn’t exactly what you will get. Anders has worked in this type of comedy for years. He also wrote HOT TUB TIME MACHINE (2010), SHE’S OUT OF MY LEAGUE (2010) and WE’RE THE MILLERS (2013). INSTANT FAMILY is funny, but it is more a dramedy because of some of the issues it touches and moments it goes for. Within the shell of this comedy, there is material that rings true and can be quite emotionally affecting. Sean Anders and his wife actually did foster, then adopt, three children. The reality of that experience informs this story and keeps it from being too schmaltzy or sentimental. Byrne and Wahlberg are great in the leads. Notaro and Spencer are entertaining as the social workers. The kids are all good; Isabel Moner as 15-year-old Lizzie, is the focus of the kids’ stories and she does a solid job here. Audiences might recall her excellent and very different performance in SICARIO: DAY OF THE SOLDADO (2018) where she played the kidnapped daughter of a drug lord. INSTANT FAMILY is rated PG. It supplies decent laughs and takes the audience on a rewarding emotional journey.